Sometimes I’m haunted by a meal I’ve had, or a meal I know I need to create. 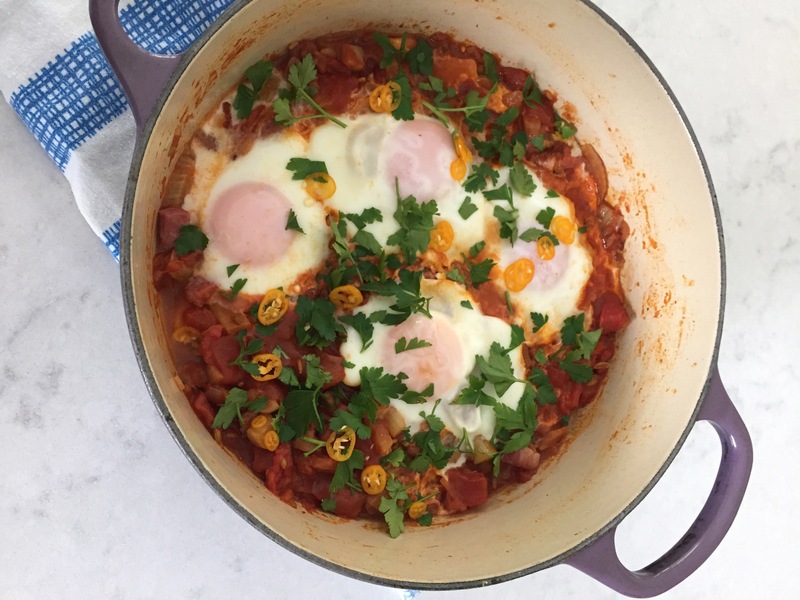 My craving for these baked eggs in a spiced tomato sauce, most often called shakshuka, has been a constant companion for ages. Then one Sunday the planets aligned. My boys were having a night at my parents’ house, I was a little hungover and I had just the ingredients peering at me in the fridge when I was staring into it for inspiration for a rare leisurely breakfast. 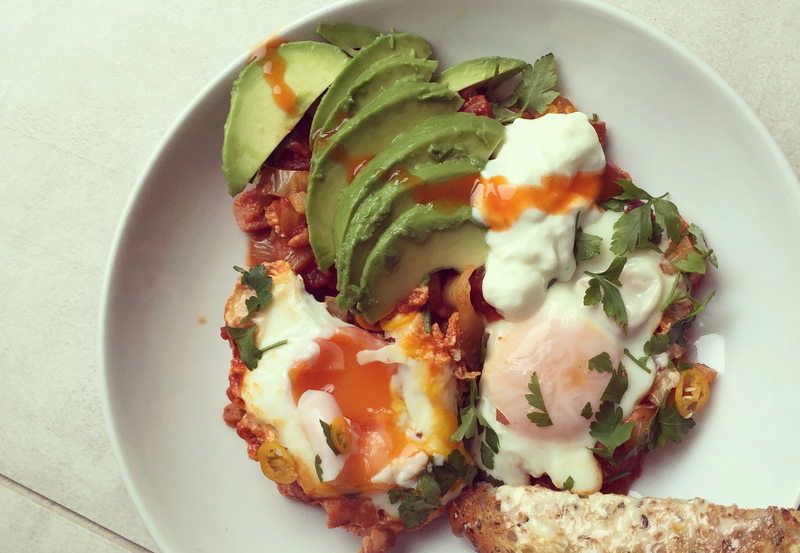 You don’t need to be hungover to enjoy these eggs. 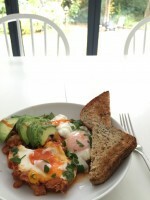 It needn’t be breakfast time either, in fact this is a dish I have since made for dinner more often than breakfast. What I love is that the sauce can be made ahead of time, and even frozen. Then the eggs can be popped into the warmed sauce to cook just before serving. 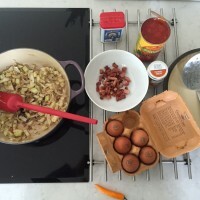 You can even make double the sauce and use half with the eggs, and the rest as a pasta sauce another time. If you don’t want to use bacon, just use a half tablespoon of oil to cook your onions and vegetables. Take the recipe below as a guiding principle and add or subtract what suits you. The only thing that should remain is the tomato sauce and the eggs, everything else is up to you – although I do insist you add the fresh last-minute elements to really make it perfect. And please eat it with hot buttered toast, it is very sad not to. Toast for dunking. Something robust and seedy is perfect. 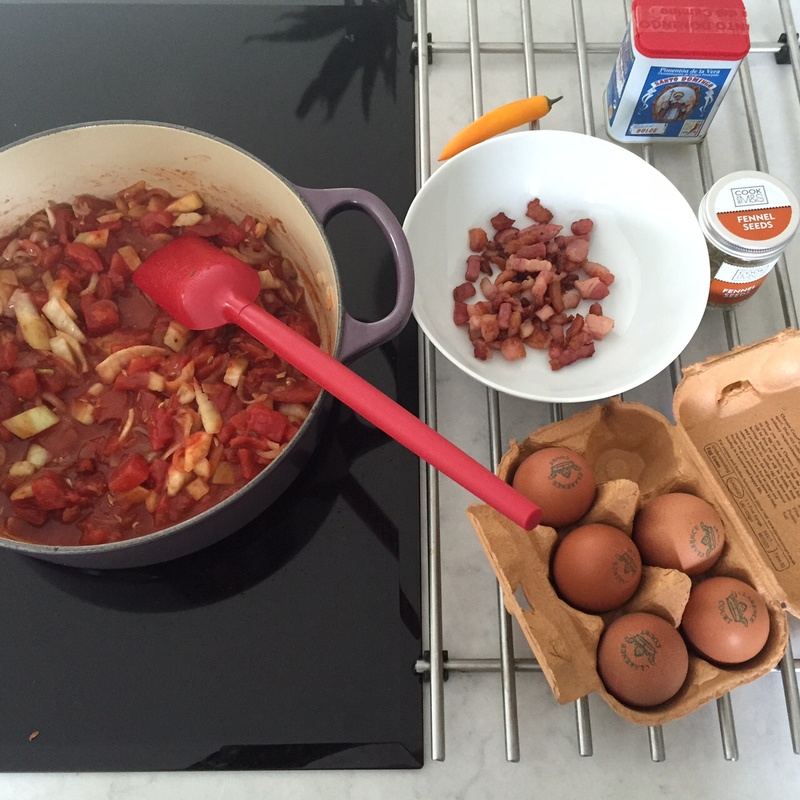 Put your pan on a medium high heat and add the chopped bacon, pancetta or lardons. No need to add any oil as the bacon will release enough as it cooks. Leave the bacon to cook while you chop your onion. I use shallots or spring onion as they aren’t as harsh tasting as regular onions and cook to a sweet mellow flavour much more quickly. If using shallots, peel them by cutting each end off then slicing them in half length ways. Remove the skin then make 3-4 slices in each half length ways. Turn the half the other way and cut across width ways so you have small cubes. If using spring (green) onions, simply slice them in 1 inch slices using all the white and green parts. Set the chopped onions aside. Give your bacon a stir, by now the fat should be releasing and the bacon should be starting to crisp and smell heavenly. Continue to cook it while you chop your vegetables. Chop your fennel and pepper into small chunks (see my videos of how to do this) and add them to the pile of chopped onions. When your bacon is crisp, scoop it out of the pan, leaving the oil behind and pop it into a small ramekin or bowl. 6. Add the pile of chopped veggies to the bacon oil in the pan and stir well. Cook on a medium high heat for around 5 minutes until they soften and start to turn golden before adding the fennel seeds and smoked paprika. Stir and cook for a minute before adding the tomatoes and turning the heat up to high. 7. Stir the pan and, if need be, fill the empty tomato can with warm water and gradually add it so that the vegetables are just submerged, but not swimming in liquid. Pop the lid on listen for the sauce coming to the boil. You’ll hear the lid rattle a little and fast bubbling inside the pan. At this stage, turn the heat down to low, keep the lid on and head off for 20-30 minutes to do something else. 8. After 20 minutes or so, come back to the pan and have a look to see how it is doing. Take the lid off and give it a stir. You want the sauce to be thick and stewy not too liquid or soupy. If it is looking too wet, leave the lid off and tun the heat up to bubble off some of the liquid for a few minutes. 9. Taste the sauce and add salt and pepper and a touch or red wine vinegar to brighten everything up. The red wine vinegar transforms it so don’t leave it out. At this point you could keep the sauce in the fridge for 3 days or freeze it. 10. 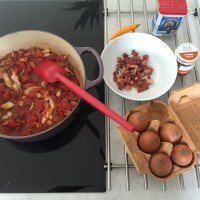 When you’re happy with the flavour and consistency, return the chopped bacon to the sauce and then make four little indentations in the sauce, equally spaced around the pan. Break an egg into each indentation then sprinkle the top of each of the eggs with a little salt before popping the lid on the pan and cooking on low-medium for 8-10 minutes depending on how soft you like your yolk. 11. While your eggs cook, toast your bread and chop some parsley or basil, slice and avocado and chop a chilli ready to top your feast. 12. After 5 minutes of the eggs being in, take the lid off and peek in. The whites should be almost set and the yolks should have a wobble but be more opaque than they were when they went in. The heat of the pan and the sauce will continue to cook the eggs so they should look just under what you’d like them to be when you eat them. If the whites are very soft still, pop the lid back on cook for a couple more minutes. 13. To serve, scatter the herbs and sliced chilli over the eggs and sauce then scoop the eggs and sauce onto a warmed plate. Top with the avocado, crumbled feta or goats cheese and blobs of yoghurt. A final sprinkle of the smoked paprika or a splodge of hot chili sauce is perfect. Serve with toast for dunking and enjoy. Find more recipes for eggs, avocado, brunch/breakfast and fennel here.